VertaseFLI was contracted by Golder Associates to undertake repairs to the cap, leachate tanks and existing drainage at the now completed staple quarry landfill site. Settlement and slippage around the leachate tanks had caused cap failure and failure to some of the drainage. Excavations were undertaken under the supervision and direction of the engineer to assess the work required with repairs being undertaken by the VertaseFLI team. Repairs to the tank and drainage were undertaken which included the replacement of some sections and the welding of new HDPE boots. Additional drainage was also installed and a new section of Geocomposite Liner installed over the tanks. On completion, the site was hydro-seeded and a new perimeter fence erected. 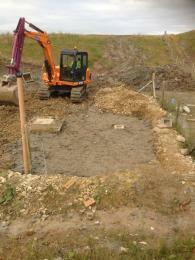 The work involved careful excavation around the former leachate tanks to investigate the inflow of surface water. It was found that surface water was entering the leachate tank and failed surface (cap) drainage was not functioning correctly. Repairs were undertaken to the leachate tanks including the welding of new connection boots to prevent the inflow of surface water. 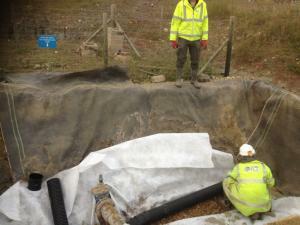 Improvements were also made to the cap drainage to prevent reoccurrence and minimise the potential for failures. The tanks were then covered with Geocomposite liner before the site was restored and completed. A new pumping chamber and associated valves and pipework were also installed and connected to the existing system. Further drainage improvement including the clearing of existing land drains and toe ditches and the installation of new additional drainage. The slopes of the cap in places were also regarded to minimise the potential for slope failure and re-occurrence of the problems rectified. The site was then hydro-seeded to complete the works with a new security fence erected.